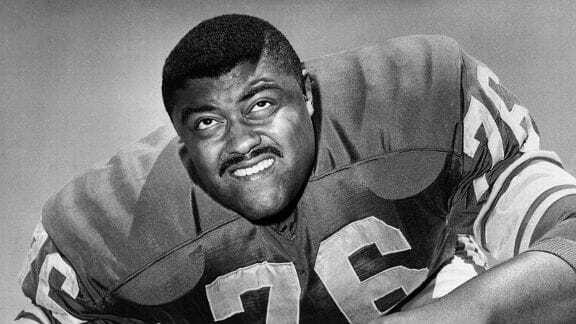 Roosevelt “Rosey” Grier was born July 14, 1932 and grew up to become an American actor, a singer, a Christian minister and spent several years sharing his talent as a professional American football player. Rosie spent time as a college football player for Pennsylvania State University, and in later years earned a seat in the National Collegiate Athletic Association 100th anniversary list of 100 most influential student athletes – an impressive recognition to say the least. From there, Rosey went on to be a professional player as part of the New York Giants and most notably the original Fearsome Foursome of the Los Angeles Rams. Rosey also played in the Pro Bowl twice. Rosey’s unique career took off after the NFL where he dabbled as a bodyguard for Robert Kennedy during the 1968 presidential campaign. He was assigned as the guarding to the senator’s wife, Ethel Kennedy, during the Robert F. Kennedy assassination. Although Rosey was unable to prevent that killing, he bravely took control of the gun and subdued the shooter, Sirhan Sirhan. Where most men would hang their coat and call it a game, Rosey moved on from there and embraced other endeavors. He became a television host of his own Los Angeles television show and made approximately 70 guest appearances on various shows during the 1960s and 1970s. From here, Rosey dabbled as a singer where he first released singles on the A label in 1960, and over the following twenty-five years he continued to record on various labels including Liberty, Ric, MGM and A&M records. Most notable of his singing career was his tribute to Robert Kennedy entitled “People Make The World” (written by Bobby Womack) that made the charts peaking at #128 in 1968. You might say that Rosey is his own man clearing his own path in life. He is also well know for his passionate pursuit of hobbies not traditionally associated with men. 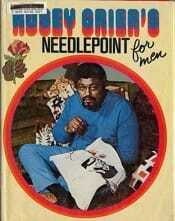 He is the author of several books, including Rosey Grier’s Needlepoint for Men in 1973. Rosey also became an ordained Christian minister in 1983 and applies his unique experiences in life in inspirational speeches he gives as he travels throughout the USA. Most notable, Rosey founded “American Neighborhood Enterprises” which is a nonprofit organization that serves inner city youth. Following Rosey’s college career on the defensive line at Penn State University, Rosey was drafted as the 31st overall pick in the third round of the 1955 NFL Draft by the New York Giants. Rosey played with the Giants between 1955 and 1962, where he led the team to a NFL Championship in 1956 and the Eastern Conference Championship in 1958, 1959, 1961 and 1962. Grier was selected for the Pro Bowl in 1956 and 1960, and was named All-Pro at the defensive tackle position in 1956 and 1958–1962 (Source > Wikipedia). Following time spent in New York with the Giants, Rosey was then traded in July 1963 to the Los Angeles Rams. 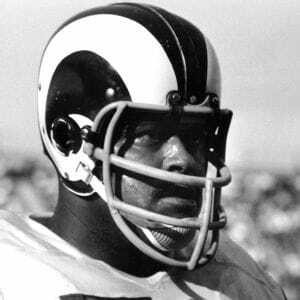 He became part of the well known “Fearsome Foursome”, (other members included Deacon Jones, Merlin Olsen, and Lamar Lundy) who were considered one of the best defensive lines in football history. Sadly, his football career ended in 1967 due to a torn Achilles tendon. Despite being the oldest member of the Fearsome Foursome, Rosey is in fact the last surviving member of the Fearsom Foursome. 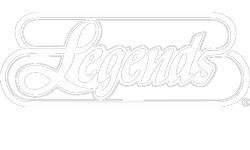 Legends Sports Bar is honored to have had Rosey visit us this past Saturday November 22nd, 2014.